I was just share about my boy short sight last week and this morning I came across this article in my Facebook and I can't wait to share it here. This is a remedy that believe can reduce the eye sight power, well no harm trying. Good recipe provided by a Chinese medicine practitioners, he said he had a nephew once 1000 degrees of myopia, he would ask him to cook this recipe, drink everyday, 8 months later the nephew's myopia fell to only 200 degrees. Mix the 3 ingredients in adequate amount, boiled into a tea, longan seed does not have to break. For the lens of the eye that is not normal, like problems including myopia, hyperopia, astigmatism, and so on. 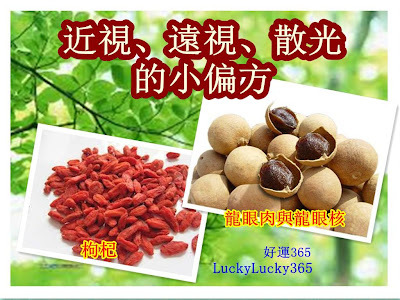 Be sure to use a longan with SEED; only use with longan flesh, the effectiveness is half. Drink after meal, works best. To read more can refer here.